A couple of years ago we made an island border, it was the first large border in the garden to be dug. We planted it with various shrubs, one of which was Sambucus Nigra “Black Lace”. 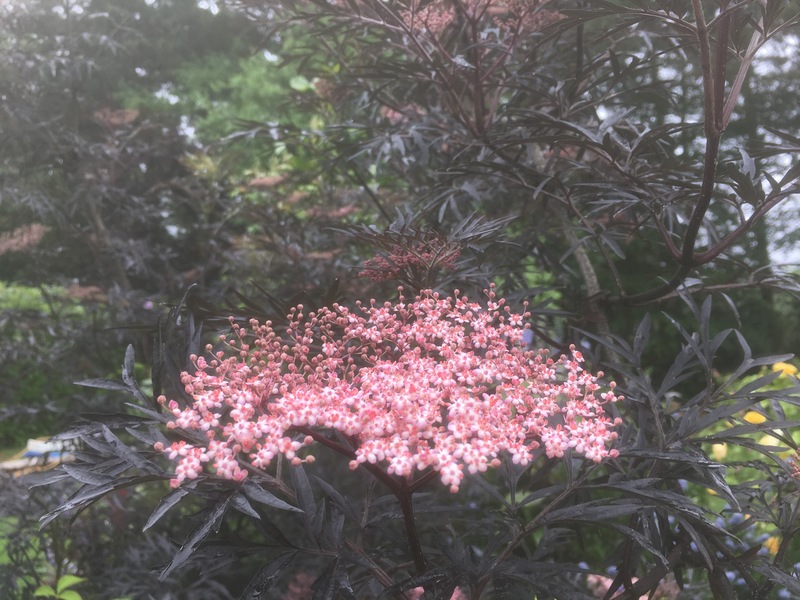 This dark purple-leaved shrub has grown vigorously and is now flowering, which means we can have a go at making Elderflower Cordial. Collect around fifteen medium-sized Elder flowers, preferably fully opened and put into a bowl with a sliced lemon and lime. Try not to take any critters with you. In a pan, put a kilo-bag of granulated sugar with some lemon rind. Add half a kettle (1 ltr) of boiling water and heat until the sugar is dissolved. Leave to boil for a few minutes. Take care not to burn yourself on wayward splashes. 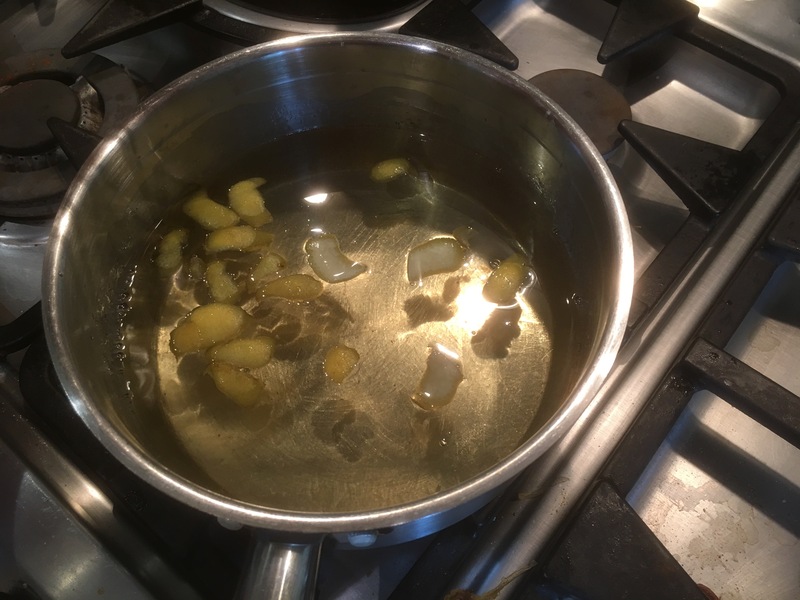 Dissolve a small box (50g) of Citric Acid (available from Chemists) into the sugar syrup and then carefully pour the sugar syrup onto the Elder flowers, steeping them in the hot liquid. 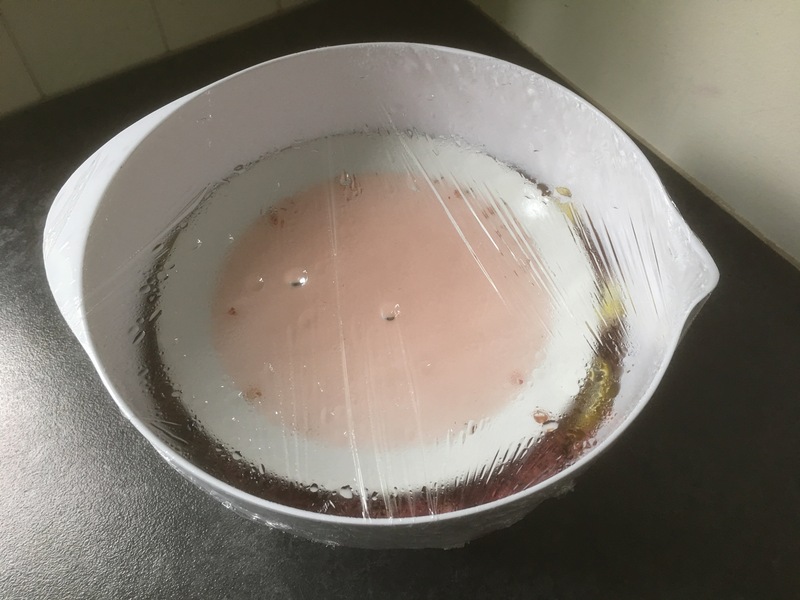 Press the flowers down with the weight of a side plate or pan lid and then cover the bowl with cling film. Finally, fish out the the citrus, flowers and pass the cordial through a muslin or coffee filter paper to remove any cooked critters. 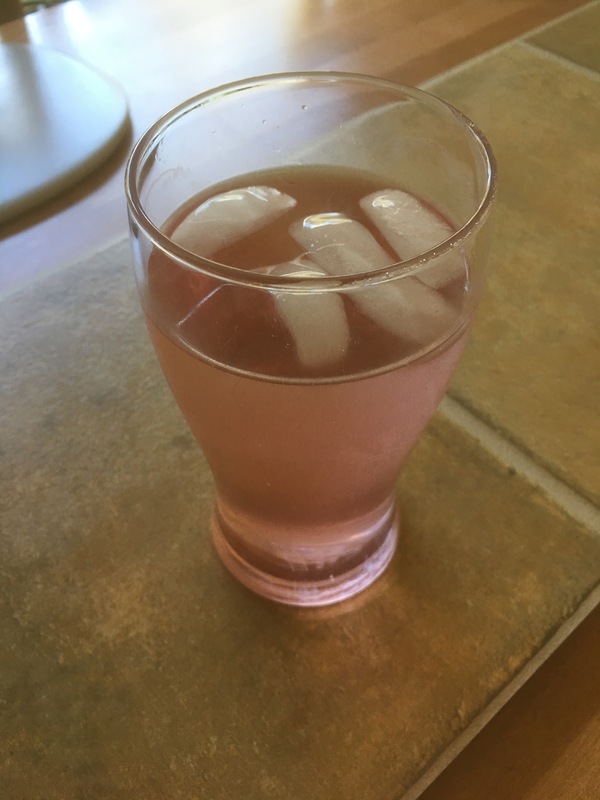 Bottle the cordial up in something air-tight and you can then serve this diluted with water or soda water (strength to taste) and ice for a refreshing drink on a hot day. 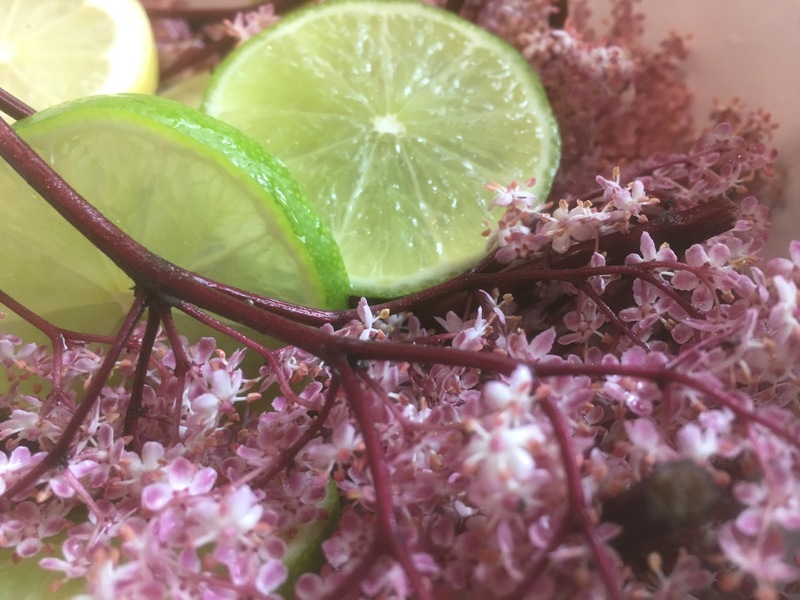 Elderflower cordial made from a “standard” green Elderflower shrub will be clear, ours has a beautiful pink tinge that comes from the dark colouring in the flowers and stems, they both taste delicious; summer in a glass. Cheers Sunil!! Looks lovely and refreshing. Thanks, Lynn, it’s fun to make too. We have many more flowers open so we’ll be making our third batch soon! Hello Mrs Mac, there seem to be no end of flowers on ours, every time we pick them a new set opens. The shrub is young but it grows vigorously. Looks great! We have a Black Elderberry, maybe this summer I’ll pick the fruit and help Judy make some cordiall of our own. Thanks, Jason, it’s particularly refreshing with soda water, perfect for those hot sunny days, whenever they decide to turn up, that is! Suni,l I was just saying to Myra that we should introduce Sambucus Nigra “Black Lace”. to our garden. If we do, I will take another look at this post for your recipe. This shrub has grown very quickly for us. We bought it small and it’s taken about two and a half years to get to flower enough to make several bottles of cordial. We might manage to get one last set of flowers out of it. If you introduce one, it won’t be long before your swamped with cordial, great for presents! Looks tasty! It’s hotter than Hades today so too bad I can’t reach right into the computer and enjoy a glass! It’s to moreish that it doesn’t last long. I might have to plant another shrub in the garden to keep the supply up with demand! We must have arrived at the time of the year when my garden catches up with yours! Our wild native Sambucus nigra, with its white flowers, is in bloom along the roadsides in my neighborhood. Collecting flowers and making cordials seems easier than collecting the fruit to make jelly, as my mother did one year. I loved that elderberry jelly, but she refused to ever make it again! Hello Jean, we’ve never collected the berries as the birds always get to them first and picking whole flower heads is much easier than individual berries. I’ve never seen elderberry jam for sale so your mother is right in that it seems too much hassle for anyone to make! Next Post: What a Load of Rubbish!